Originally featured in the Omaha World-Herald on December 14, 2013. The first library in Benson began in 1894 and was housed in the public school. In 1915, Benson residents became eligible to use the Omaha Public Library for an annual fee of $485.77 paid by the Village of Benson. A library station opened at Sprague Drug Store, and the druggist was paid 1 cent per book circulated. After Benson was annexed by the City of Omaha in 1917, Benson residents pushed hard for the library to have its own space. The Benson Library officially opened in 1923 as part of the Benson Community Building, which also housed the local fire station. 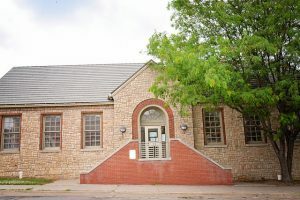 As library use and the collection of books continued to grow in the area, Benson citizens once again advocated for a new building with a community room for public meetings. After repeated attempts, a new building was planned and built in 1942 at its current location, 6015 Binney St. The building was designed by John Latenser & Sons and was constructed mainly with Works Progress Administration labor. Due to war shortages, construction materials and labor were scarce and much of the building is made from recycled material. For example, the facing stones on the exterior of building were originally paving stones from 20th Street. The library has changed greatly since 1942. The branch installed air conditioning in 1957, and in 1979 the library acquired two adjoining lots to the west which were turned into a much needed parking lot. When the branch began to show signs of wear, a renovation took place in 1997. Under the design of architectural firm Alley Poyner, the library tripled in size. The addition reflected the building’s original exterior design and preserved facing stones for several interior walls. Today, Benson Library serves a thriving and eclectic community.